The SG8MTS uses the same proven fixed carbide pilot tooling as SG8M but now has a front mount steering wheel for spindle downfeed. 1. 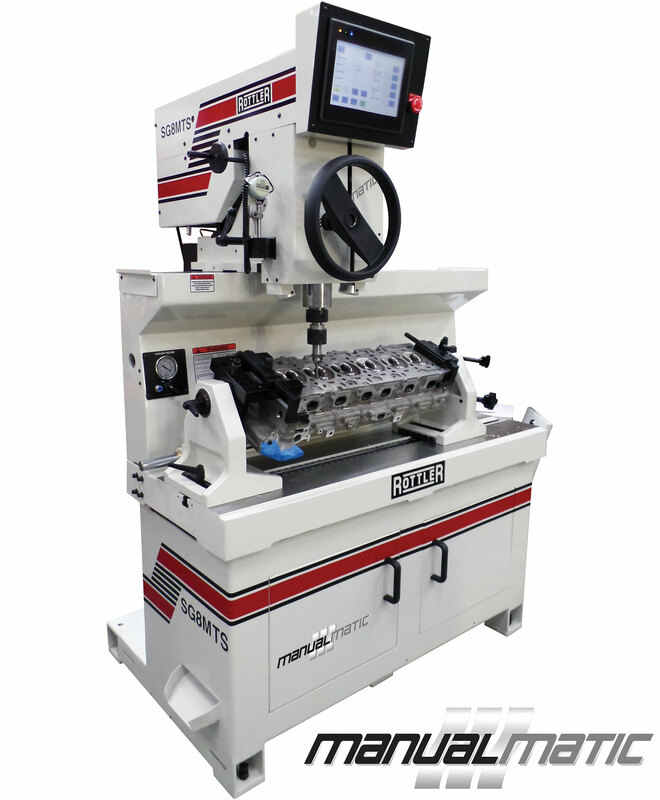 MANUALMATIC – a brand new concept has been added to these machines which should increase productivity by 30-50%. During seat cutting, the operator does not have to operate any buttons or switches, simply turn the spindle feed steering wheel up and down and the control takes care of all the functions like workhead float/clamp, pilot centering in the valve guide and spindle on/off. When depth of seat is reached, the control automatically changes spindle RPM to high/finish speed to give equal depth of every seat and consistent surface finish results. 2. MANUAL – the buttons on touch screen are the same as the previous SGM machines. There is no external dial gage, the spindle vertical position is displayed on the touch screen. 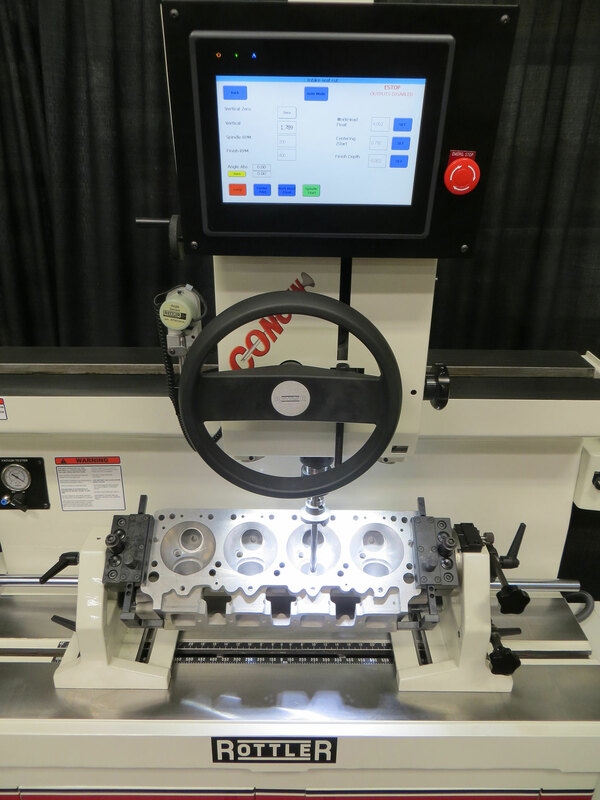 Simply feed the spindle down until the cutting insert touches the valve seat, touch set zero button and then the digital display will show exactly where the spindle is at all times. The change from low to high/finishing speed is easier as there are 2 separate buttons. The foot pedal for clamp and float of workhead has been eliminated and now controlled on touch screen for manual and automatically for MANUALMATIC. The SG8MTS features Rottler's trademark CONCEN that guarantees you get the most accurate and versatile machine possible. Rottler combines precision carbide centering pilots with a light weight air float workhead to giveyou perfect centering with the valve guide - every time. This guarantees the best CONCEN of valve seat to valve guide centerline in the industry. 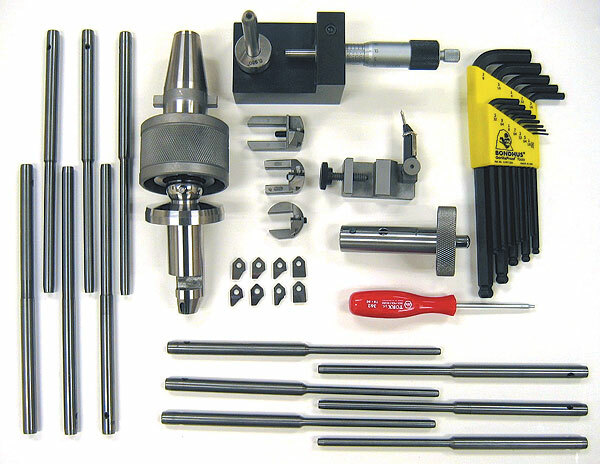 Rottler's Rigid Precision carbide centering pilots are manufactured to a fine tolerance. Combined with the light weight air float workhead the SG8MTS gives perfect centering in the valve guide and the best concentricity of any machine on the market. 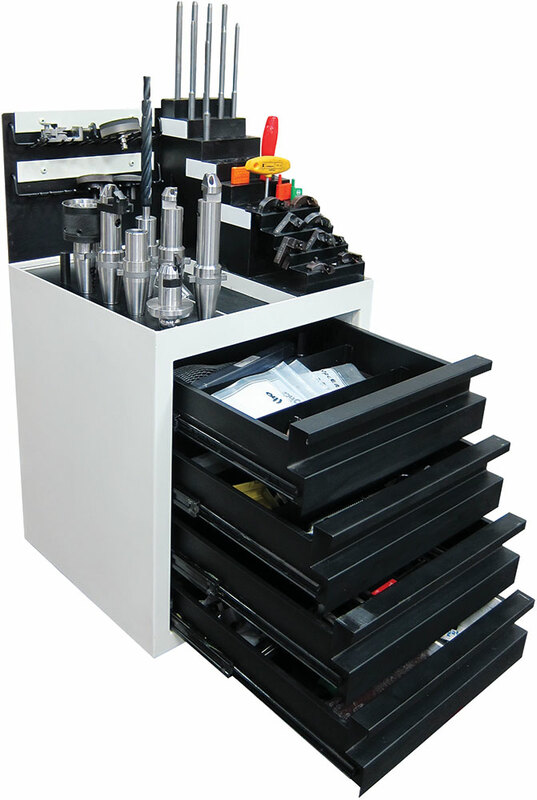 Three Drawers and Top Tray allows convenient storage of wide selection of tooling available from Rottler. Rottler's Precision CNC Ground Fine Grain Carbide Seat Cutting Inserts are available in many different designs to suit customer requirements. Single angle, multi angle or curves and radius shapes are available. Cutting tools are substantially faster and less expensive than grinding, where a different grinding stone is required for each angle. Heavy thick wall cast iron machine castings and precision machining during the manufacturing process give excellent chatter free valve seat cutting. 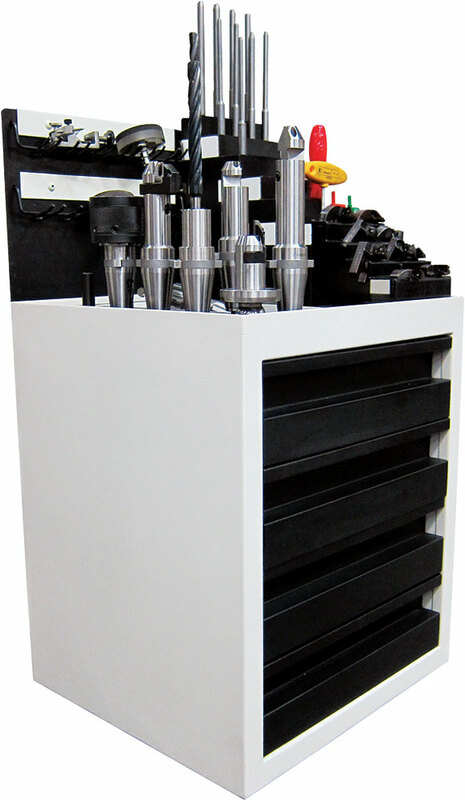 Heavy duty cabinet/base extended to the rear for safe handling when machine has to be moved. Recessed toe kick allows more comfortable machine operation. 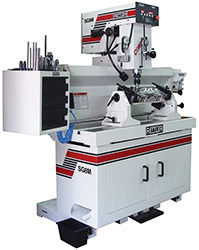 The SG8MTS has a light weight workhead for fast and accurate centering for the minimum concentricity. 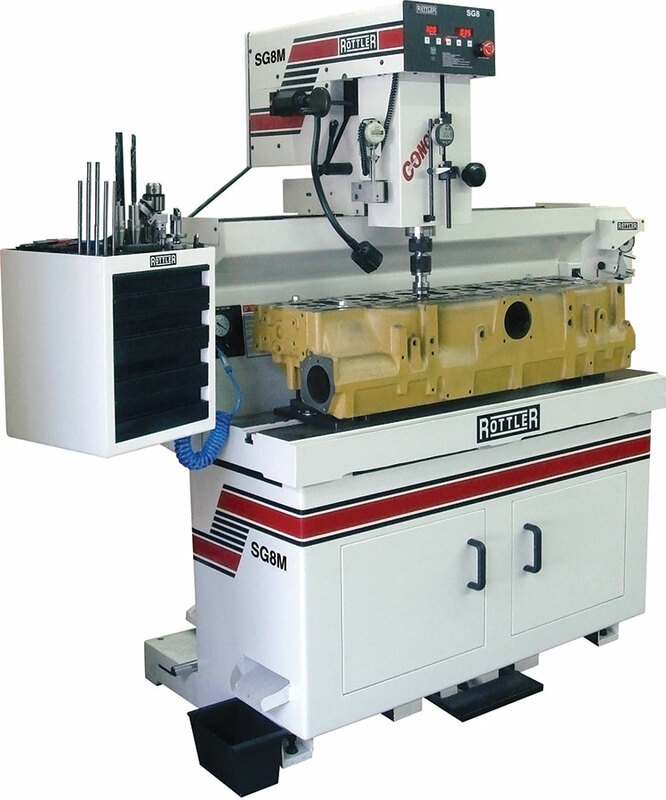 At the same time, the workhead is heavy duty capable of machining large diameter valve seats. Accurately select specific spindle speeds required for different machining operations. Soft touch buttons and bright digital display allow ease of operation. Digital readout for quick, accurate adjustment. Shows the operator exactly how much has been removed from the seat assuring consistent seat depth. Also useful for installing seat rings, reducing valve guides, facing spring seats, etc. Large handwheel provides rapid feed and small handwheel allows precise fine feed control of the spindle. Very helpful when depth of cut must be maintained to extreme levels of accuracy. on all canted valve cylinder heads. Cuts each seat to the exact same depth - a must for today's computer controlled engines. automatically, ejects tool when loosened. Rottler's patented SG tooling totally eliminates any bounce springs. 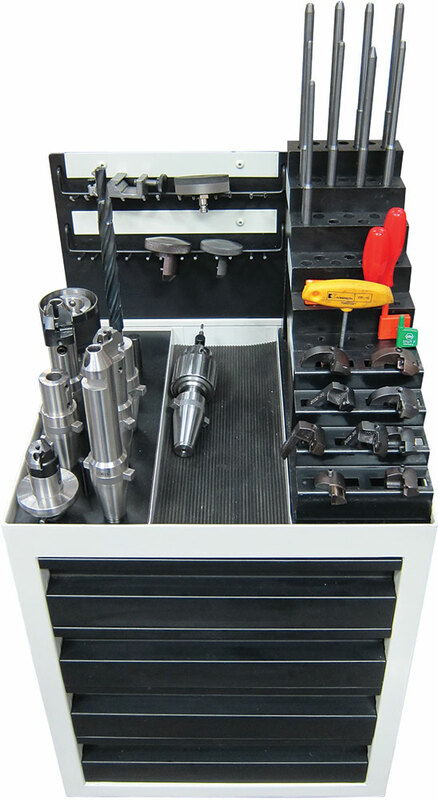 The quick change spherical spindle adapter allows different tool holders to be changed in a few seconds. Change from multi angle seat cutting to pocket boring or reaming in just a few seconds! When the collar is moved down it aligns the tool holder vertically to allow the tool holder to be easily lowered down over the fixed pilot. While the tool holder is being lowered, the collar is lifted to release the sphere for precision centering and cutting. One hand pilot removal wrench allows fixed pilots to be moved from guide to guide - fast and easily. A Holder Kit is included to handle jobs that are outside of the Roll Over Fixture profile. With the Rottler SG8MTS you can accurately select specific spindle speeds required for different machining operations. The bright digital touch screen display allow ease of operations. With Rottler's Dual Speed Spindle Feed you can use the large handwheel to provide rapid feed and the small handwheel for precise find feed control of the spindle. The 360 Degree Rollover fixture provides quick loading and easy access to all sides of the head.